Christmas is just around the corner, and unless you are amazingly organised and have managed to sort all your presents out early, you are now probably starting to say to yourself “I must get going on all the gifts I have to buy” whilst looking at your to-do list in dread. Here at The Beauty Rooms Day spa in Bristol, we can all entirely relate to this feeling, mainly because we are all in the exact same boat. Christmas is the time of year that we all want to get right and treat our loved ones to gifts that they are not only going to remember, but that they will also enjoy. We have been working hard to get our Christmas selection right this year, being able to offer you the chance to purchase gifts that are special, whilst also being completely hassle free. Christmas is an extremely magical time of year, and the festive spirit ignites a feeling of unity and joy at the act of giving. It’s these times of true excitement that really make this time of year so special, which is why it all simply must be perfect. This year, we are honoured to be stocking a large range of Guinot gift boxes all designed with this ethos in mind. The decadent and slick packaging has been designed to showcase Guinot’s iconic branding, boasting ultimate luxury throughout all options whilst also offering you some fantastic savings on truly beautiful products. These gifts are guaranteed to make your loved ones feel incredibly special on this magical day. The gift sets available from Guinot vary entirely, and have all been curated in order to not only introduce the recipient to a professional skincare regime, but also a possible advance on your own personal routine. The sets include the Hydrating Collection; Lift and Glow Collection; Longue Vie Collection and a Skincare Saviours collection which incorporates some of the most popular products from Guinot. 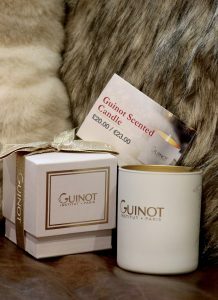 As well as skincare, we will also be offering a beautiful Guinot Aromatic Scented Candle perfect for these dark Winter evenings, as well as a Mirific Bauble, which will be the ideal addition to your enchanted Christmas tree. To discover the whole range, please do not hesitate to pop into our salon and take a peek at all the beautiful sets Guinot have to offer. 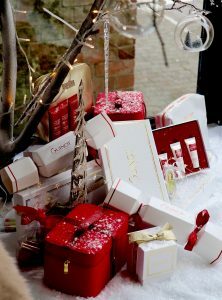 Bespoke Beauty Rooms Gift Bags? 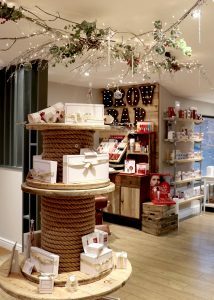 In addition to all the gorgeous Christmas gifts we have available, we also will be offering our Beauty Rooms Day Spa gift vouchers. Packaged in a beautiful gift bag, with a selection of Guinot/ Clarins treats, a salon brochure and a gift card that will last for twelve months, this is the ultimate gift to treat your loved ones to something they can use and utterly enjoy. Our gift cards are redeemable against any service in our salon, and are therefore an ideal present, especially for someone in need of a little pamper after the festivities are over. These gift cards can be bought in our salon, or alternatively can be bought online for your convenience. If you would like to know more about any of the products we have on offer, please do not hesitate to pop in and discuss what you are looking for with a member of our team. Or, feel free to give us a call.